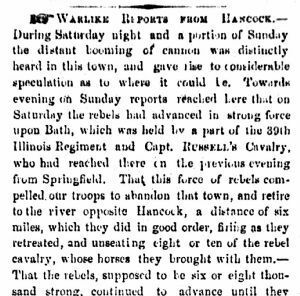 Week of Jan 8 1862 - Warlike Reports from Hancock. During Saturday night and part of Sunday the distant booming of cannon was distinctly heard in this town, and gave rise to considerable speculation as to where it could be. Towards evening on Sunday reports reached here that on Saturday the rebels had advanced in strong force upon Bath, which was held by a part of the 39th Illinois Regiment and Capt. Russell's Cavalry, who had reached there in the previous evening from Springfield. That this force of rebels compelled our troops to abandon that town, and retire to the river opposite Hancock, a distance of six miles, which they did in good order, firing as they retreated, and unseating eight or ten of the rebel cavalry, whose horses they brought with them.— That the rebels, supposed to be six or eight thousand strong, continued to advance until they reached the river opposite the town, our troops having in the meantime crossed over to the Maryland side, with the loss of but one man who was drowned; Capt. Russell and Lieut. Nesbitt being the last to cross and bringing with them some four of the enemy's horses. That the rebels then planted their batteries within range of the town, and deliberately fired two shots into it, one of them passing through the house, and the other over the stable of Mr. BARTON.— That on Sunday morning they sent a flag of truce across, notifying tie women and children to leave at once, as they intended to shell the town within an hour. That the firing then commenced on both sides and continued at intervals until evening. That the rebels were finally driven from their guns by the Federal batteries and riflemen, and obliged to fall back from the river without having seriously injured the town. This is the substance of the reports which have reached us, and we give it for what it is worth. There are some four regiments of Federal troops at Hancock, viz: the 89th Illinois, 84th and 110th Pennsylvania, and the 1st Maryland, with a battery of six guns and Russell’s Cavalry, but there are said to be others on the way. The troops are under command of Gen. LANDER, who reached Hancock on Sunday morning.